Previous studies have established that obesity and asthma are related. Now, a large study of more than 21,000 European children suggests that having asthma as a toddler increases a child’s risk of become obese – and not the other way around. The University of Southern California researchers dug into data that had been collected between 1990 and 2008 from nine different countries, capturing information until the children were 8 years old. 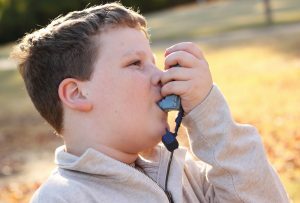 In the study, published in the European Respiratory Journal, having asthma at the age of 3 or 4 was associated with a 66 percent higher risk of becoming obese than those without an asthma diagnosis. While the exact relationship between the two is still being studied, researchers theorize that kids with asthma may be less active, which can lead to weight gain. Asthma medications may also play a role. Get more news from Allergic Living to your inbox.